In a published video appeal, the elders of Baksan request to protect the rights of Black Sea Shapsugs and, in particular, Ruslan Gvashev in the Krasnodar Territory. The prosecution of Ruslan Gvashev for a moleben at the Tulip Tree is a discrimination against the minorities, the Baksan elders noted. 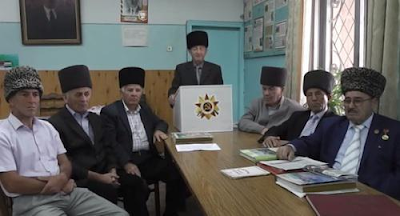 On June 2, the Lazarevskoe District Court of Sochi found Ruslan Gvashev, the former chairman of the Council of Elders of Circassians-Shapsugs, guilty of organizing an unsanctioned action on the Day of Adygs' Memory – a prayer service near the Tulip Tree, and fined him by 10,000 roubles. The "Caucasian Knot" has reported that starting September 11, Ruslan Gvashev, is holding an unlimited hunger strike in protest of the judgement to fine him for a prayer he administered at the Tulip Tree. Today, the "Caucasian Knot" SMS-service has got a message reporting that the elders of Baksan (Kabardino-Balkaria) published a video appeal in support of Ruslan Gvashev. The video appeal shot by the elders of Baksan and public associations published on YouTube is addressed to the authorities of the Krasnodar Territory, Kabardino-Balkaria, Adygea, Karachay-Cherkessia, and human rights organizations. The elders of Baksan asked to protect the interests of Black Sea Shapsugs and, in particular, Ruslan Gvashev and expressed their concern over his health state. The authors of the video appeal emphasized that on May 21, all over the world, the Adygs hold prayers in memory of their ancestors killed during the Caucasian War. "This year, Ruslan Gvashev was fined by the Lazarevskoe Court for participating in the moleben at the Tulip Tree in the Golovinka village. And that is gross violation of human rights and discrimination of the minorities. That short-sighted act contradicts the norms of coexistence in our multinational country, and it can lead to unpredictable consequences in the relations between the people living on the Black Sea coast," the elders of Baksan state. Ruslan Gvashev's health deteriorates sharply, Gvashev's defence claims authorities' attempts to control memorable actions of Circassians, Sukhumi rally calls on Putin to protect Gvashev's rights. Черкешенка из Иордании Иман Бише в финале "Arabs Got Talent"
Марьям Багова: "Мы, учителя родных языков, не были в курсе всего того, что происходило в нашем учебном заведении"
AdygPlus. Picture Window theme. Powered by Blogger.